Marvellous Catering is a local, family-run catering company. For them we developed a web-based application that would help them organize their workload. They wanted to simplify what had become a tedious weekly process of tracking jobs. The business has grown steadily over the years and they recently built a new, larger kitchen and opened a lunch restaurant on the property. Enter the job while you’re on the phone! The system is designed to enter the job information when the phone call comes in. Most jobs are from repeat customers, so this Job screen helps look up the client so you don’t have to type in the contact information over and over again. Since clients often ask “What did we have last time?”, you can look up a job and copy it to make a new job. Change the date, the number of servings, etc. and its done! 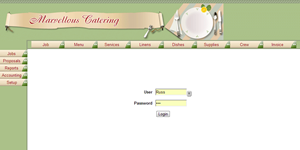 Designed for the caterer who doesn’t want to do administration! Once the basic job is set up, you enter the menu items they want. Assign the services and supplies they have selected, the assign the crew and your job is complete. You don’t have to set up data ahead of time, all the assignment screens scan the database for previous values used and makes a list on the left. Select from the list on the left or start typing and match’s will appear, select one anytime, keep typing to enter a new value (which will become part of the selection list from now on). If you’re entering a new job, make it easy by clicking the ‘Show All’ tab, every item will appear with check boxes, simply check the boxes of everything you want to assign then go back to the Edit tab to add additional notes. Sorting is controlled by the caterer, so the menu is listed in his logical order. Enter notes for the job and/or for each food, service, supply, or crew assignment. It all prints out on the job sheet so you don’t have to remember to tell somebody. Reports save a tremendous amount of time! Print a day’s, week’s, or month’s worth of individual job sheets. Print daily, weekly, or monthly serving counts so you can order the right food and the right amount. Print daily, weekly, or monthly job calendars so you see how busy each day is and when you’ll get a break! Print weekly or monthly crew calendars. Print crew copies for an individual or for all individuals, or print a master schedule with every crew assignment on one calendar. All calendars can be expanded to show job and/or crew details or keep it lean by just showing the basic job information. Finally, generate a professional invoice, detailing counts, per person cost, taxes, gratuity, add-on services, etc.